Last year I adapted a mini rucksack for him, it had lots of beads to play with, a felt animal book, stick on wooden animals and toys/books inside but being a whole year and a bit older he has outgrown it. So I found some little suitcases, sadly I had to buy a set of 3, I only wanted one but BabyEbi has had a busy afternoon packing and unpacking the two smaller cases. I was surprised that he picked the duck design, I thought he'd go for the frog one. 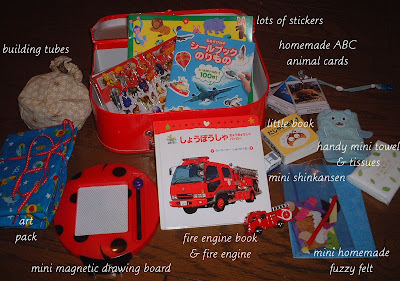 All the items inside.....construction tubes, art pack, magnetic drawing board - he loves these, fire engine book and fire engine, home made fuzzy felt, mini book, mini shinkansen, handy mini towel and tissues, abc animal cards and lots of stickers, The final item not shown is a smaller version of the mystery bag, the mystery items will be whatever is handy on the plane! should keep him quiet. The abc animal cards are a spin off of some that I made last year. Last year I made a set with pictures of everyone in our family, he has always loved these cards and still gets them out, now he is talking he can actually name everyone. So this year, I decided to make abc cards since he is still very much into letters and decided to use animals as a theme but tried to pick more unusual animals that he doesn't already know to expand his vocab. I laminated the cards then punched a hole in them then put them on a big ring, and added a cord with a snap clip on it which is great because I can clip them to him aso he doesn't drop them when we are out. Impressive! It looks like you have planned the trip well. But, for you sake and his, I hope he does sleep.